NE-12 Chrysoberyl Cat's Eye Necklace 18"
Genuine chrysoberyl cat's eye is extremely rare. Most purveyors of this gem on the internet fraudulently or unknowingly are offering quartz cat's eye or apatite cat's eye which is much much more common and much less expensive. High quality chrysoberyl cat's eye can sell for over a $1000 a carat in larger sizes. So this is a way to get a lot of genuine chrysoberyl cat's eye at a dramatically lower price. The value is very fair for an extremely rare gemstone necklace but though there are many nice beads in this necklace for a few thousand dollars more one could possibly get a higher quality necklace. The photographs are of very high resolution in order to show you what an upper quality genuine chrysoberyl cat's eye necklace looks like. Also to help you understand the quality of the cat's eye beads you would be getting. Please also take note of the bead size description. These necklaces are graduated and are not large beads. The size of the beads varies from 5mm to 3mm. If you have an issue with Ketu in your chart or you are moving into a Ketu Dasha, this necklace could be of especial interest to you. There are enough beads to transform this necklace into a double bracelet if you prefer to wear it this way instead of a necklace. All the known mines in the world for chrysoberyl cat's eye have run out of supply and have closed down, hence this gemstone is becoming dramatically more expensive each year. This necklace is composed of Natural Chrysoberyl Cat's Eye 3-5mm Rondelle Beads. The length is 18", it is 65 to 70 carats in weight. Length including the clasp is about 19 inches. Note: The images show multiple necklaces, the $440 price is for one necklace. 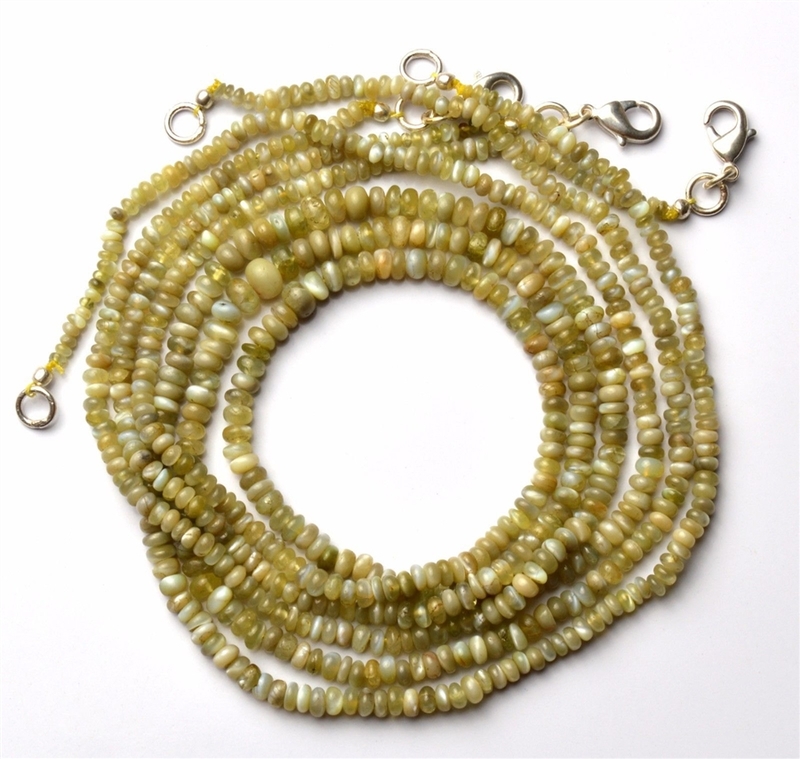 Natural Chrysoberyl Cat's Eye 3-5mm Rondelle Bead Necklace 18 inches, 65 to 70 carats in weight. Length including clasp: about 19 inches.